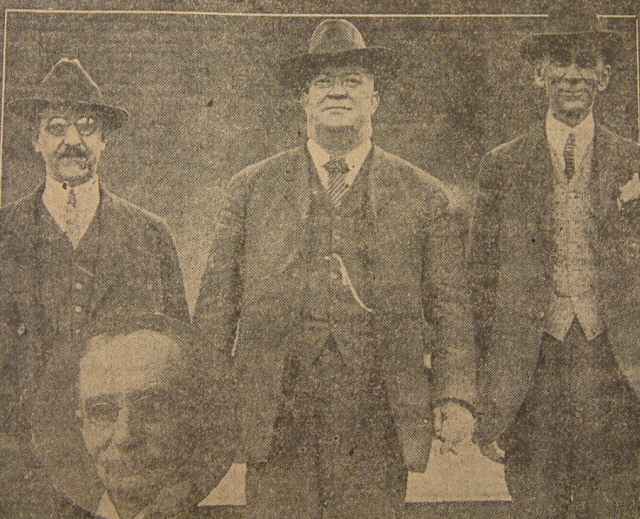 At the left George Dennewitz; center, John Bromberger; right, James Gerard; inset, William Bussard. All were members of the famous old Fourth Regiment band, which more than 25 years ago was one of the crack musical organizations of Ohio. Their last appearance in a big public demonstration was for the dedication of the soldiers monument, which now stands at Monument avenue and North Main street, July 29, 1884. The four men with William Devere, drum major, now of Columbus, are the only members of the organization now living. Of the four shown, all but Mr. Bromberger reside in this city. The later went to San Francisco many years ago and he has since been a member of the California militia band and symphony orchestra. He was director of the Fourth Regiment band. Returning to his western home from a visit to Brooklyn he stopped in Dayton for a visit with old friends, and the members of the band held a reunion at the home of Lucius Cook, on Maple street. Mr. Cook's father had been business manager of the organization. Mr. Bromberger has not seen relatives in the east for 40 years.